This is not your typical wedding… Destination weddings are not typical, and having it in Las Vegas with just a very small group of your best friends and close family makes it even more unique and intimate. Here are some of our favorites from Billy & Krystle’s destination wedding at the newly-remodeled Golden Nugget in Las Vegas! Only in Vegas can shoes like this fit in like normal! She got so many compliments all day on these shoes, it was amazing! After Krystle got ready, we set up a “first look” moment for the two of them to make their big reveals and see each other for the first time. I liked this image of Krystle stepping out of the Golden Nugget to cross the street and tap Billy on the shoulder. I just love photos of people genuinely laughing! Then it was time to head up to the ceremony, where they made it clear to us that we really should not take any photos. I managed to sneak just a couple to help document the day, and actually got out the trusty iPhone to video the ceremony for them. Then we ran on down to the Venetian for dinner at one of my favorite restaurants there, The Grand Luxe. When in Venice, a gondola ride is a must-do. If you’ve never been to Venice or Las Vegas, the boatmen sing operatic love songs to the riders for the entire boat ride up and down the canal. Then we hit the streets in the huge stretched Hummer and got photos at all of the big sites in Las Vegas that we had time for. It was actually their first trip out to Vegas, so they were SO excited to see all of these amazing sights that they’d previously only seen in movies. The Golden Nugget boasts a 200,000 gallon shark tank with a water-slide going right through the middle of it, and one of Krystle’s must-do items was to go down it in her wedding dress! One of the bridesmaids decided to get in on the action as well. Billy planned to go down it as well, but since he was wearing jeans I think everyone managed to talk him out of it. That would have been a long, uncomfortable walk back up to the hotel room to get changed and dried off! There’s not much more uncomfortable than soaking wet jeans. Congrats, Billy and Krystle! We were really honored to be there, capturing so many fun and memorable moments at your destination wedding in Las Vegas! 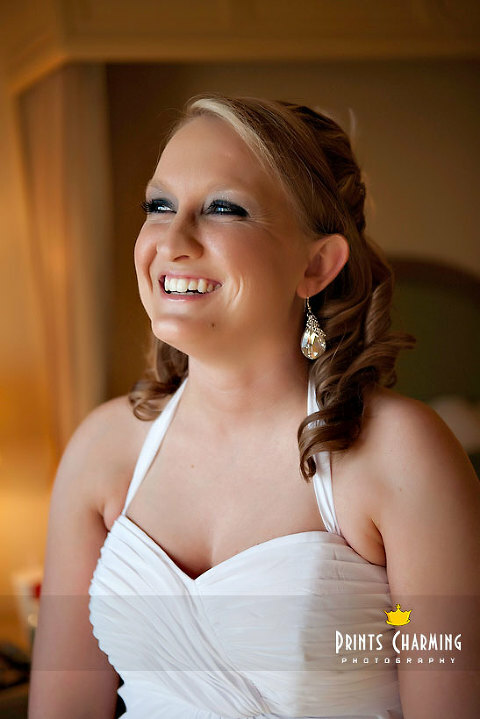 Family and friends can view the entire wedding gallery online, using Krystle’s maiden name as the gallery’s passcode.